Redshirt junior is making her second consecutive NCAA East Preliminary appearance in the shot put…enters the meet as the No. 19 seed…currently sits at No. 4 all-time on FSU’s top 10 list in the shot put outdoors and No. 5 indoors. Outdoor: Has continued to develop as one of the top shot putters in school history…dropped a career-best bomb of 16.04 meters (53-7.50) at the Texas Relays in her outdoor opener…placed eighth at the ACC Outdoor Championships and was runner-up at both the Crimson Tide Invitational and Seminole Twilight meets. Indoor: Enjoyed banner season, moving up the all-time rankings in both the weight throw and shot put…finished fourth at the ACC Indoor Championships with the No. 2 weight throw mark in FSU history (20.10m/65-11.50)…also finished seventh in the shot put with a new indoor personal-best (15.55m/51-0.25) – the first 50-foot throw of her career – helping the Seminoles claim the team title…currently sits at No. 5 on FSU’s all-time indoor list in the shot put. 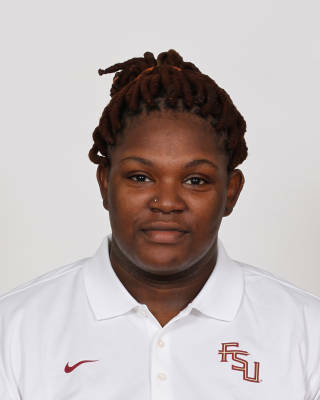 Outdoor: Posted then career-best shot put of 14.99m (49-2.25) to place sixth at the ACC Outdoor Championships; one of three `Noles to score in the event under first-year throws coach Dorian Scott…recorded her first win at the Florida Relays, capturing the collegiate division with a mark of 14.55 (47-9). Indoor: Unleashed a season-best weight throw of 17.95 meters (58-10.75) at the ACC Indoor Championships to place seventh…top shot put mark of the season came in the opener at the Crimson Tide Opener (14.26m/46-9.50) which she parlayed into a season-best fourth-place finish. Outdoor: Competed in five meets during her inaugural outdoor campaign for the `Noles…also dabbled in the hammer throw for the first time in her career…top shot put throw of the year came at FSU Relays, while her best finish was a fifth in the shot at the Seminole Invitational. Indoor: Made her FSU debut after sitting out the 2011 season as a redshirt…was at her best in the final meet, placing eighth in the weight throw at the ACC Indoor Championships with a season-best mark of 17.28m (56-8.50)…also advanced to the finals at ACC’s in the shot put with another personal best (13.43m/44-0.75). Was late to begin track & field career at the high school level…distinguished herself as a state champion and record-holder in weightlifting at North Marion High School…majoring in criminology…born November 26, 1991.